For as long as there have been Android phones, iPhone owners have accused phone makers of taking what Apple does and then morphing it into their own designs. The less charitable amongst them simply called the likes of Samsung out for good old-fashioned copying, and there was even a court case based around that fact. We’re now over ten years down the line from the time the iPhone changed the phone world, but the phone world is still changing based on what the most recent iPhone looks like. That has never been more apparent than when you take a look at a graphic that was put together by one Reddit user. That graphic first shows what phones looked like before the iPhone, and then what they looked like after its release. The similarities are, of course, impossible to ignore, but we all knew that. What about something a little more recent? 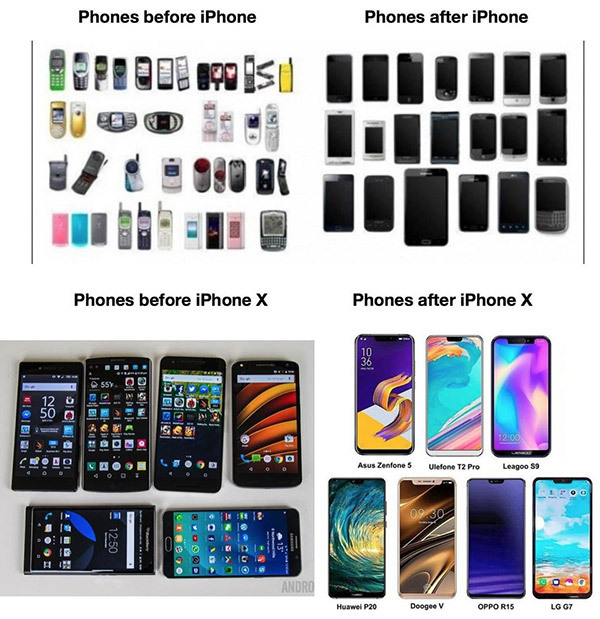 The graphic also takes what phones looked like before the iPhone X‘s release, and then again what they look like now. As you might have guessed, phone makers have now taken the iPhone X design and sought to mimic it as much as possible, even adding their own notch whether the technology inside requires it or not. When all is said and done, looking like the latest and greatest iPhone is good for business. None of this should really be a huge surprise to anyone who has been keeping a watchful eye on the phone industry over recent years, but it does manage to put the phone world into context; many companies seem to base their designs on Apple’s, rather than basing them on designs they came up with themselves. Of course, there are only so many different ways you can stick a glass screen to a metal shell, so it’s arguable that even if the likes of Huawei and Oppo wanted to do something their own, it would still look eerily familiar. Years before the iPhone PocketPC, Smartphone OS’s existed along with Blackberry, the PPC world was known for the stylus and touch screen input, this was around 2002 and earlier. Phone designs take years to develop and antenna technology was still evolving. So to put up flip phone and candy bar phones as a before the iPhone is incorrect. There were smartphones before the iPhone. I should know I have owned many, many different phones, smartphones, PPC, SmartPhone, WM, BlackBerry, Android, PalmOS, and even SymbianOS. They all offered something Apple didn’t and they all catered to a very wide range of user needs. Apple in 2007 introduced a single phone, and kept it that way for a few years until the profits needed to be met with keeping the old, with the new, then the larger phone with the old and the new and so on. Apple helped spur innovation and design language, but they did NOT create the SmartPhone market. I beg to differ. Talking about full screen smart phone was non-existence prior to first gen iPhone. Samsung and Prada attempted to capture the market after they caught wind of iPhone full screen release. I owned both: Samsung Mystic and the Prada (kinda forgot the model name). They advertised it as fluid and smooth. Damn was it slow and laggy. PalmOS and blackberry had better widgets than other companies but their widgets and their phone design did not change until iPhone came out. Imagine if HTC copies the design of blackberry, they’ll get sued for copying too. We are talking about the design of things here not the OS itself. If going back is too difficult then you can search and see how Android phone makers before after the bashing of the iphoneX notch. 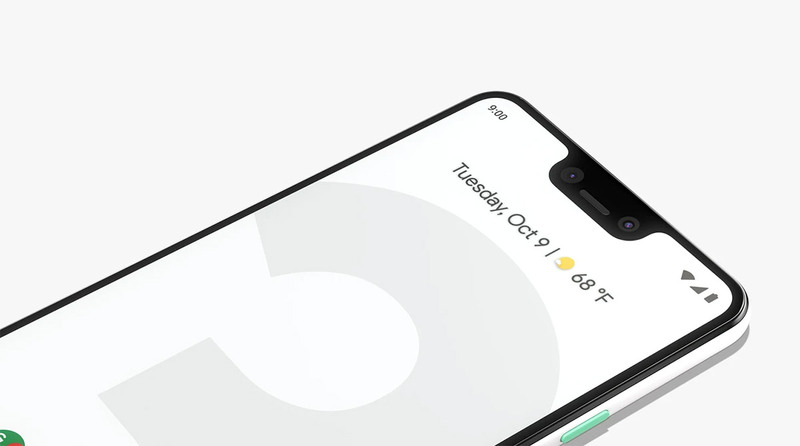 Bashing the notch then later release phones that got the notch.